Although some people may consider the earliest Barbie dolls antique, in actuality antique Barbie dolls will not exist for many years to come. By strict classic definition, a doll must be at least one hundred years old to earn the honor of being an antique. 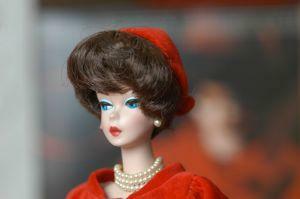 However, most doll collectors, doll dealers and doll specialists consider any doll made before 1930 an antique. The main reason for this seemingly arbitrary cutoff date has to do with the porcelain factories in Germany that produced doll heads. These factories used the same molds to make porcelain doll heads from the 1880s throughout the 1920s, making it difficult to determine the exact age of some dolls of the times. It is interesting to note that at doll shows run by the National Antique Doll Dealers Association, vendors can exhibit dolls made prior to 1949. Introduced at New York's American Toy Fair in 1959, the first Barbie doll quickly won the hearts of little girls everywhere. Selling more than 351,000 of the teenage fashion dolls in the first year, Barbie has been a staple in the toy industry ever since. The idea of a teenage fashion doll came to Ruth Handler, co-founder of Mattel Toys, as she watched her daughter playing with her two-dimensional paper fashion dolls. The child was imagining her paper dolls in the role of grown-ups. Mrs. Handler designed Barbie in the style of a German fashion doll, manufactured from 1952 to 1964, named Bild Lilli. She named the Barbie doll after her daughter. Barbie's hair was either blonde or brunette styled in a fashionable below the shoulder ponytail with curled ends and curly bangs. Her eyebrows matched her hair color and she had stylish red lips and blush on her cheeks. This is the only year that Barbie's eyes had no color. For Barbie being a teenage fashion doll means having lots of beautiful and trendy outfits. For decades Barbie clothes, accessories, wigs and shoes have filled Barbie closets and wardrobes in little girl's bedrooms and playrooms everywhere. Barbie's friends and family also love to look fashionable and have stylish wardrobes of their own. Over the coming years Barbie will continue to be loved by little girls everywhere as they play with their favorite teenage fashion doll. Barbie doll collectors will continue to search for the perfect doll for their collection as the oldest of these vintage dolls approach the title of antique Barbie dolls.